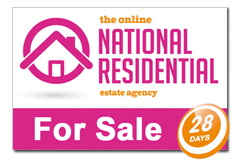 Once you have registered with National Residential you can view and bid on a property 24 hours a day from the comfort of your PC, IPad, Tablet or Smartphone. 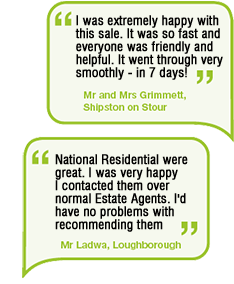 We use the very latest Online and SMS (Text Messaging) technology to enable buyers to monitor properties, place bids, arrange viewings and to keep them constantly informed of current highest bids. We offer buyers world leading modern technology to save time and to have the best opportunity to win the bid and buy the properties they want. You’ve seen a National Residential property online and you’re eager to view and bid for it, so your first step is to simply register with our online bidding system. We operate two different online auction platforms depending on the type of property sales: non-Registered and Registered Auctions – please see details for each auction type below and for further details click the link to the Buyers guide . Our ‘non-Registered Auctions’ require bidders to confirm they have agreed to National Residential Terms & Conditions of Online Bidding and to enter a security code supplied during the bidding process to confirm their bid. Bidders do not need to register a payment card online in order to bid, instead bidders agree to make a payment by BACS or by debit/credit card at the end of the auction if they win as part of the Terms and Conditions they have agreed before submitting the bid. This system suits certain residential property sales especially where buyers are not used to registering payment cards online or do not use credit/debit cards (for example, this might include elderly buyers who purchase bungalows who are not usually accustomed to using online auctions and making internet payments). To place a bid with National Residential for a ‘non-Registered’ auction, simply place a bid on a specific property online. We ask for your name and mobile number so that we can text you a code to your mobile. You enter this code online to confirm your bid and to confirm that you a legitimate buyer. Please feel free to call our office on 01244 757152 (Mobile Friendly) or 0800 6123694 (Freephone) anytime – before, during or after bidding. We can answer any questions you have, arrange viewings, walk you through the process and/or make sure you have all the information you need. 1. When you are ready to bid, simply enter your bid amount together with your mobile telephone number. 2. Enter the 5 digit code we send you by text to confirm your bid. 3. Your bid is submitted. If you do not have a mobile number, or if you prefer to speak with us personally, you can also call us on 01244 757152 and register with our sales team. Our ‘Registered Auctions’ platform is provided by the ‘Essential Information Group’ (EIG), a secure, independent online auction service provider since 1991 – pls see https://www.eigpropertyauctions.co.uk. Registration is a two-stage process which requires bidders to register a payment (debit/credit) card securely online (SAGEPAY).Payment is automatically taken from the registered card of the winning bidder at the fall of the electronic gavel at the end of the auctions. 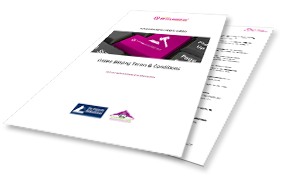 This method suits ‘must sell’ properties and where buyers are more accustomed in using online payments. 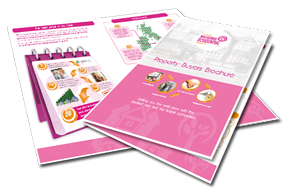 This method suits ‘must sell’ properties and where buyers are more accustomed in using online payments. To bid on a ‘Registered Auction’, simply follow the ‘Login To Bid’ button the auction you want to place a bid on. You will be required to register a credit or debit card for the bidder security deposit. We use Sagepay who provide a secure, online card registration facility, and they will attempt to place a ‘hold on funds’ on your account for the bidder security amount (often known as a ‘payment shadow’ as no money is taken at this stage). The bidder security amount will be clearly displayed when registering your card. 1. When you are ready to bid, follow the ‘login’ button on the property details auction page. 2. Enter your name, email and a password to register a Passport Account (required to bid). 3. EIG will send a link in an email to the given email address which you will need to click to activate your account. 4. Submit additional information required to view legal documents and/or bid (contact details, proof of identity, financial details to pay holding deposit). If you have any concerns or difficulties in Registering the information you need to bid, please call us on 01244 757152 and we will do all we can to help. For more information please see our Bidding & Buying Process Explained page.